I don't know how many people out there are still using floppy disks; for at least the last four years I myself haven't used them at all. In my book, however, a floppy disk remains a convenient medium for temporarily backing up and storing a small amount of data. It's a shame that floppies have an annoying tendency to go belly up, isn't it? Today's post is for those in the audience who have floppy disks containing Classic Mac applications and documents that they want to make use of on an Intel Mac via the SheepShaver emulator. Below I'll show you how to bring a floppy disk volume into the SheepShaver environment assuming that you can get that volume mounted on the OS X desktop in the first place. Back in 1999 I bought a VST USB floppy disk drive to accompany my G3 iMac - let's dust it off, shall we? (As you may know, VST isn't around anymore: the extant www.vsttech.com Web site notwithstanding, VST was years ago acquired by SmartDisk, which in turn has more recently been taken over by Verbatim.) I hook the VST floppy drive up to my Intel iMac; the drive shows up in the System Profiler's Contents ⇒ Hardware ⇒ USB section but, unlike the Iomega ZipCD drive discussed in the previous post, does not appear in Disk Utility's "disk, volume, or image" menu unless I load a disk into it. One of my mountable floppy disks is a "Claris" floppy that holds ClarisWorks 2.1 plus a set of supporting files ("Claris Fonts", "Claris Help System", etc.) - we'll use this disk as our 'test floppy' in the following discussion. The official SheepShaver home page states that SheepShaver provides "access to floppy disks". More specifically, Gwenolé Beauchesne's SheepShaver Help Center sports a Using SheepShaver page with a "Using floppy disks" section that reads, Floppy disks are not automatically detected when they are inserted. They have to be mounted explicitly: after inserting a floppy disk, press Ctrl-F1. I launch SheepShaver and install the VST drive's "USB Floppy Support" driver in the Classic HD disk's System Folder. I insert the Claris floppy into the VST drive and then restart SheepShaver. Sure enough, the Claris disk does not show up on the desktop, in the Apple System Profiler, or in Disk First Aid in the emulated environment, nor does it appear in the via-the-Unix-interface Volumes folder. Pressing Ctrl-F1 has no effect. (1) Upon adding /Volumes/Claris/ to the SheepShaverGUI Volumes menu, the SheepShaver boot pops up this box; an attempt to initialize the "unreadable" Claris disk generates this box and then this box. Subsequently, no new disk appears on the SheepShaver desktop or in the Apple System Profiler, whereas Disk First Aid shows a "(name unknown)" disk whose verification indicates that it has problems that cannot be repaired. # A lot simpler than for a CD, huh? Adding /dev/disk2 to the SheepShaverGUI Volumes menu gives no new disk on the desktop, in the Apple System Profiler, or in Disk First Aid in the emulated environment. I don't know what role, if any, this plays in SheepShaver's non-recognition of floppy disks. If the floppy disks are 1.44MB disks, they should mount in Leopard when inserted into the connected USB floppy drive, no special drivers needed. 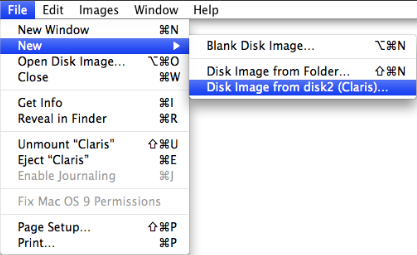 The disks can, however, not be seen in SheepShaver, there is no way to mount floppy disks directly in SheepShaver for MacOSX. Using Disk Utility, you can make a disk image from a mounted floppy disk and add that image file to the volumes list for SheepShaver. Next time SheepShaver is launched, that volume will be mounted in SheepShaver. 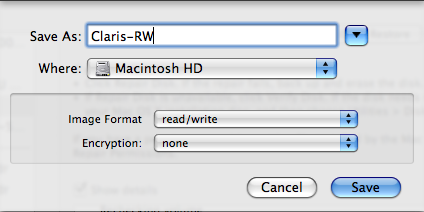 • Clicking the Save button will save a Claris-RW.dmg disk image file to Macintosh HD, my root volume. • The Image Format control cannot be left at its "compressed" default option, nor can it be set to "read-only" - SheepShaver will not recognize the floppy volume (it'll pop up a "This disk is unreadable..." box) for these options. As shown, this control should be set to "read/write"; a bit curiously, the "DVD/CD master" option is also OK - the disk image file will have a .cdr name extension in this case. (4) Quit Disk Utility. Open SheepShaverGUI and add the floppy disk image (/Claris-RW.dmg or whatever) to the Volumes menu. Launch SheepShaver; when the boot is finished, a disk containing and named after the original floppy volume will be waiting for you on the desktop. My unmountable floppies show up in Disk Utility and I can see the underlying disks in the /dev directory; unsurprisingly, attempts to image them were unsuccessful. Suffice it to say that if a floppy can't be mounted, then there's not much that you can do with it. In the following post, I'll briefly discuss my attempts to connect to the Internet in the SheepShaver environment. SheepShaver will unproblematically mount a data CD containing a single volume written in a single session - you don't need to do anything special in this case - check out this screen shot from Blog Entry #131, for example. A data CD with several volumes written in several sessions is another kettle of fish, however; for a multisession CD, SheepShaver's default behavior on my computer is to only mount the volume written in the first session. For example, I have a CD-RW that contains "Tulane", "Tulane Stuff", and "Microsoft Office 98" volumes respectively written in "Session 1", "Session 2", and "Session 3" - only the "Tulane" volume appears on the SheepShaver desktop. How might we get SheepShaver to mount the other volumes? The box's Format control toggles between a ProDOS 0K option and a blank option - helpful, huh? For either Format option, typing in a name and clicking the Initialize button pops up an "Initializing will erase all information on this disk" box; clicking the latter box's Continue button pops up a "Disk initialization failed because the disk is locked!" box. Note that the actionable partitions have an "Apple_partition_scheme" type name. As great as iTunes is, I also think that the AppleCD Audio Player is a really cool little program. I spent countless hours listening to audio CDs with the AppleCD Audio Player on my G3 iMac, and naturally I was interested in having a go at playing an audio CD with the AppleCD Audio Player in the SheepShaver environment, even if only for nostalgia's sake. (Forget for a moment the choppy playback of Liquid Audio tracks discussed in the previous post.) The AppleCD Audio Player is part of the Software Restore iMac HD.img package that we installed on the Classic HD disk in Blog Entry #131 - it's sitting right there in the Applications folder - so all we now need is an audio CD to try it out with. (1) Upon adding /Volumes/Steady Pull/ to the SheepShaverGUI Volumes menu, the SheepShaver boot again pops up a "This disk is unreadable by this Computer" box - this time the Format control toggles between Mac OS Standard 3K and ProDOS 3K options - as before, attempted disk initialization pops up "Initializing will erase all information on this disk" and "Disk initialization failed because the disk is locked" boxes. For all initialization choices, when the boot is finished the CD does not appear on the SheepShaver desktop or in the Apple System Profiler; Disk First Aid shows a "(name unknown)" disk whose verification indicates that it has problems that cannot be repaired. From their sizes, it is clear that the zeroth partition, disk1, corresponds to the CD as a whole, whereas the other CD_DA partitions (at least diskutil info disk1 execution suggests that they're partitions, but I'm not totally sure) correspond to the individual CD tracks. Adding /dev/disk1 to the SheepShaverGUI Volumes menu gives no new disk on the desktop, in the Apple System Profiler, or in Disk First Aid in the emulated environment; without getting into the details, supplementing the /dev/disk1 reference with the /dev/disk1s* track references does not help the situation. I drag out my old Iomega USB ZipCD 650 drive and hook it up to my Intel iMac, whose optical drive is obviously not doing the trick. 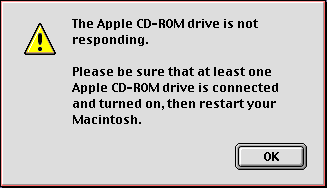 Without installing any drivers and without a CD in place, the Iomega drive immediately shows up in Disk Utility's "disk, volume, or image" menu; the Burn Support field in the drive's Disk Utility Get Info window reads "Apple Supported", so the drive should qualify as an "Apple CD-ROM drive", yes? I launch SheepShaver and then install Toast 4.1.1 on the Classic HD disk via the Iomega drive's accompanying "Solutions" CD. Ever the optimist, I load the Steady Pull CD into the Iomega drive; the CD is promptly mounted on the OS X desktop. I restart SheepShaver, giving in the emulated environment...nothing: no Steady Pull disc on the desktop, in the Apple System Profiler, or in Disk First Aid. FWIW: The Steady Pull folder can be dragged onto the Classic HD disk but, even with their .aiff extensions, the Steady Pull files are not recognized by QuickTime Player 4.0.1 and are played as static by RealPlayer 8 Basic. QuickTime Player will play the Steady Pull files if they are brought into the SheepShaver environment via a Disk Utility volume, but I fail to see the point in doing this. I'm sure that someone with a detailed knowledge of the CD Audio file system, Red Book vs. Orange/Yellow Book CD architecture, and/or Unix could get SheepShaver to recognize an audio CD as an audio CD, but I am not that person. We'll talk about SheepShaver and floppy disks in the next entry. (5) play Liquid Audio audio files. AppleWorks files, and in my experience files of all other programs, can be brought uncorruptedly into the SheepShaver environment via a Disk Utility volume, whose creation we detailed in Blog Entry #130. In the emulated environment, the "AppleWorks" executable in the /Applications/AppleWorks 5 directory opens and writes to these files without incident. mv /"My AppleWorks File" /"Desktop Folder"
(it's not necessary to quote a MyAppleWorksFile file name that doesn't contain any whitespace). (2) With the SheepShaverGUI Volumes tab's Unix Root field left at the / default, launch SheepShaver. Your AppleWorks file should appear directly on the SheepShaver desktop, but with a generic icon; the Kind: field of the file's Get Info ⇒ General Information pane will merely say "document". (3) In the emulated environment, add a .cwk extension/suffix to the file's name - the AppleWorks executable won't recognize the file if you don't do this. (4) Launch the AppleWorks executable. Via the File menu's Open command, navigate to the imported file, which should now be readable. 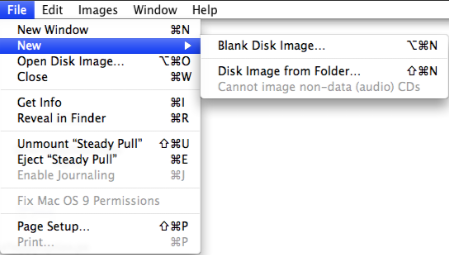 The file can now be opened normally, i.e., by simply double-clicking its icon. *SheepShaver can give rise to some strange desktop effects. For example, if SheepShaver is already running and I copy a file to my hard disk, then in many cases (depending on the file's name) the file is automatically moved to the hard disk's Desktop Folder and placed on the SheepShaver desktop after I double-click the SheepShaver Unix disk interface and then close the resulting window. There's no need to keep your AppleWorks 5 documents in the SheepShaver environment. AppleWorks 5 spreadsheets can be saved as Microsoft Excel 4.0 worksheet files directly to the OS X environment through the Unix interface and then nicely opened by OpenOffice if .xls extensions are respectively appended to their names. Similarly, an AppleWorks 5 word processing file can be saved as an RTF file, which OpenOffice, or OS X's TextEdit if it's a text-only file, will smoothly open with or without an .rtf name extension. N.B. I find that non-ASCII characters (e.g., é, £, π) in exported documents are sometimes and sometimes not translated by OpenOffice; you may have to retype these characters. I don't know if OpenOffice will handle AppleWorks drawing, painting, database, and communications documents, with which I have no experience - you're on your own with these kinds of files. MWM5.1 had been installed on my first computer, the Performa 200 discussed at the beginning of Blog Entry #126, by its previous owner - I never had the original installation disks for it. When it came time to upgrade, I copied the "Microsoft Word 5.1" executable and a set of accompanying template files - "Brochure", "Business Report", "Newsletter", etc - to a floppy disk (and later to a CD); in a classic case of novice-related ignorance, however, I didn't bring along MWM5.1's system files, and given that I can't go back to my Performa 200's hard disk and get those files because my Performa 200 is dead, my copy of MWM5.1 consequently lacks some features, e.g., the Tools menu's Spelling, Grammar, and Thesaurus commands don't work, but I can still read and write files with it. The MWM5.1 executable must be brought into the SheepShaver environment via a Disk Utility volume; at least on my computer, the SheepShaver Unix interface does not recognize it nor any other executable. MWM5.1 data files can be brought into the SheepShaver environment through the Unix interface, again with corrupted icons; however, once the MWM5.1 executable is placed on the startup disk, MWM5.1 data files that are brought into the SheepShaver environment via a Disk Utility volume will be immediately ready for use, with no further fiddling necessary, so I encourage you to go the Disk Utility route in this regard. In the SheepShaver environment, the MWM5.1 executable opens and reads my mixed-content MWM5.1 documents without any problems; gratifyingly, if these files are Save(d) As... Type "Interchange Format (RTF)", then OpenOffice will translate them intactly in the OS X environment. Besides the MWM5.1 files, my G3 iMac's hard disk also contains a bunch of Office 98 Microsoft Excel and Word files. My copy of Office 98 comes courtesy of a former employer and I again do not have its original installation CD; anticipating this very situation, Microsoft equips the Office 98 package with a "Microsoft Office First Run" application that installs any missing system components when the user launches any of the core Office applications - Word, Excel, PowerPoint, Internet Explorer, or Outlook Express - for the first time. I go to my G3 iMac's Applications (Mac OS 9) folder and copy its MS Office 98 folder to a Disk Utility volume; I bring the MS Office 98 folder into the SheepShaver environment and copy it to the Classic HD disk. I attempt to launch Excel: Microsoft Office First Run does its thing and then SheepShaver crashes. Attempts to launch Excel or PowerPoint after (a) pushing the SheepShaver RAM to 512 MB and (b) quadrupling the memory allotments for these programs via their Get Info ⇒ Memory panes also result in SheepShaver crashes. Attempts to launch Word do not induce SheepShaver crashes but instead generate an alert( ) message that reads, "The application was unable to start due to an error. Please contact customer support." I see from this page at E-Maculation.com's SheepShaver Forum that I'm not the only one having this sort of Office 98 SheepShaver experience. What could the problem here be? According to Jonathan Hoyle at MacCompanion Magazine, "Office 98 cannot run in SheepShaver due to a virtual memory incompatibility" - make of that what you will. Let me moreover note that the Office 98 Excel, PowerPoint, and Word Readme files all say, To use...Office 98, it is *recommended* that you have...[a] PowerPC processor with a clock speed of at least 120 MHz - recall from the beginning of Blog Entry #130 that SheepShaver emulates a 100-MHz PowerPC processor. But I must respectfully disagree with E-Maculation.com moderator Cat_7 when he says, There is nothing you can do vis-à-vis Microsoft Office's incompatibility with SheepShaver. If you haven't gotten the message yet, go forth and download OpenOffice, which, I can confirm, will definitely translate files in the Microsoft Word 97-98 document and Microsoft Excel 97/98 workbook file formats. In the name of completeness, I can also confirm that OpenOffice reads Microsoft Word 6.0/95 document, Microsoft Word 6.0/95 template, and Microsoft Excel 5.0/95 workbook files. Text-only Word 6.0/95/98 files can alternatively be read by TextEdit. I copy the CS ChemOffice folder on my G3 iMac's hard disk** to a Disk Utility volume, bring it into the SheepShaver environment, and then copy it to the Classic HD disk. (**In the System Folder I found only one CS ChemOffice file, "CS ChemDraw Preferences", which I did not bring along.) Even when given .cdx name extensions, CS ChemDraw Pro files are not recognized by the parent application when brought into the SheepShaver environment through the Unix interface, but can be immediately opened and written to when brought in via a Disk Utility volume. So now, if and when I extend this blog to organic chemistry, which I used to teach once upon a time, we'll be all set, eh? Every one of my Liquid Audio tracks has an .lqt file-name extension. I can bring a Liquid Audio track into the SheepShaver environment through the Unix interface - as for my other data files, it arrives as a generic "document" - launching the Liquid Player executable and accessing the track via the File menu's Open command then allows me to play it. (I'm not able to play my "passport"-protected Liquid Audio tracks, but this is an issue totally unrelated to SheepShaver.) And how's the sound? CD-quality but somewhat choppy: the choppiness is not eliminated by boosting the SheepShaver RAM or the Liquid Player memory allocation. A bit disappointing, but clearly better than nothing. Liquid Player 5.0 can be downloaded here, but I'm unaware of anyone on the Web who still offers Liquid Audio tracks for sale or for free. In the following entry, I'll discuss some SheepShaver 'experiments' that didn't go as well, specifically, I'll detail my not-so-successful attempts to play audio CDs, mount floppy disks, and connect to the Internet in the SheepShaver environment.